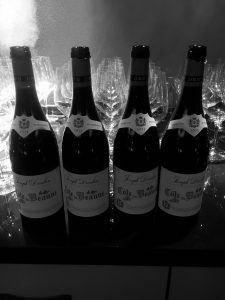 IG Wines had the pleasure of organising an amazing dinner at the Mandrake Hotel in partnership with the Burgundian legend – Domaine Joseph Drouhin. A selection of their fantastic range of wines were showcased by Christophe Thomas, Export Director of Domaine Joseph Drouhin and Cassidy Dart MW. Upon arrival, our guests were greeted with canapes and Pol Roger Brut Reserve NV; the definitive house style Champagne, composed of 30 still based wines drawn from at least three vintages! The tasting commenced with Drouhin Chablis Vaillons Premier Cru 2016, a dry and brisk wine, typical of Chablis. We decanted the wine for two hours prior to serving, which gave more freshness and allowed greater expression! After a tasty Parmesan Tapioca and Pan con Cecina, we moved on to the Puligny Montrachet Clos de la Garenne Premier Cru 2015. Thi showed amazing finesse and intensity in this wine, especially alongside the Beurre Blanc Caviar paring. After a speech from Christophe Thomas, we were all poured generous glasses of the most prestigious wines of the night; Drouhin Beaune Epenottes Premier Cru 2015 and Clos Saint Denis Grand Cru 2011. After a double decant, the 2015 displayed an intense ruby-red colour. While young, the aromas are reminiscent of red berry and cherry. It is a wine with good structure and no harshness. In fact, it suggests it could age quite well. A flavour of ripe cherry lingers in the aftertaste. The Clos Saint Denis, was the wine of the night. It has pretty much everything you would expect from a Grand Cru; aromatic depth, complexity, good concentration of fruit, multiple layers and finesse. 2011 is an odd year, it drinks perfectly already, but with years, will evolve to show a lot more. The Beef Fillet, Corn and Girolles were such a perfect paring for the two stunning wines. An absolute delight and one of my highlights of the evening! To conclude, we poured the last bottle of the night, Cote de Beaune Rouge 2015, which was served with Cashel Blue and Quince, a true delight and a great harmony! Drouhin continues to demonstrate what a class act they have become. When I asked Christophe Thomas, what vintage he would compare with the 2015, after a pause for thought, he offered the 2002 – “The 2015 has lovely structure but with a nice roundness”. This delightful evening was rounded off by a Sorrel Sorbet and Vanilla Dacquoise, which was a treat to finish these stunning wines with. A massive thanks to Christophe and Cassidy for the great evening and to the Mandrake Hotel for their excellent service and hospitality. To enjoy any of these wines please click here.